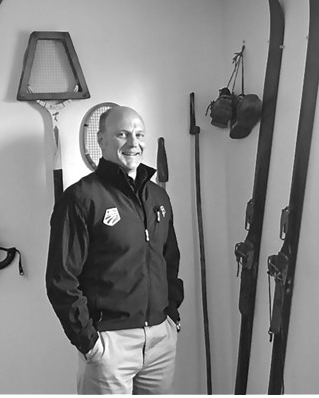 Kurt Jepson and his partners at Saco Bay Orthopaedic and Sports Physical Therapy have been working with athletes at almost every level for the past 24 years. For Jepson, that journey started in Aroostook County and has taken him to sporting venues around the world. Jepson grew up in the small town of New Sweden and credits his grandfather with sparking the interest in skiing he has carried throughout his life. In an almost mundane fashion he explained that when the roadways of his home filled with snow, a horse-drawn trailer traveled through the streets packing the snow into a single track. “You could either travel by sled or ski,” he said. Jepson skied in high school and for one year at Bates College. “But that was a whole other level,” he said. At Bates, Jepson played both soccer and lacrosse and occasionally the 54-year-old Scarborough resident still laces up his cleats and runs with younger players. “There is nothing like being part of team, the camaraderie, and knowing you’re part of it,” Jepson said. After college, Jepson worked for a time as a schoolteacher, but he missed being around competition and sports teams. He moved to Charlotte, N.C., and started working as an athletic trainer. The clinic where he worked did not cater to one particular sport, but rather provided training services to any team and sport in the area. Jepson spent nearly three years at the clinic, where he and other trainers worked with athletes from baseball, NASCAR, professional wrestling and basketball. But there is one person he still remembers vividly. “It was about the time Charlotte was trying to attract an NBA team,” he said. Jepson said the league wanted to hold three exhibition games in the area to gauge the interest of the fans. If there was enough interest, a franchise would be awarded to the city. He was referring to Michael Jordan, and in no time, Jepson found himself working on the superstar. Jepson laughed and said that was something he would someday share with his grandchildren. In 1998, Jepson moved back to Maine and he and a partner, Larry Risigo, started the Saco-based physical therapy company. During the past 24 years it has grown and the two have taken on three additional partners. Recently Jepson and Mike Hersey, who also works at Saco Bay Physical Therapy, were board certified by the American Association of Physical Therapy. Jepson is proud to point out that there are only four people in the state with that designation and he and Hersey are two of them. The company now has eight offices from York to South Portland and it employs nearly 60 people, but for Jepson it still comes back to helping athletes. Jepson recently finished working as a team trainer for the U.S. Olympic Ski Team, something he has done for the last three Olympic games, and now he hopes to help the young skiers in his community. Jepson has two sons in high school and is the head coach for the Scarborough ski team.